David Briggs continues the conversation in Part 2 of Modern and “Traditional” Color Theory. 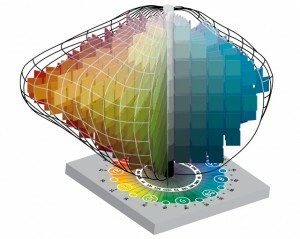 Traditional color theory uses the ideas of the “color wheel” and the value scale, but typically these are not integrated into any kind of practical three-dimensional color space. For example, in The Art of Color Itten reverts to Runge’s early 19th century sphere model, which (unlike Munsell’s sphere) places the strongest colors of all hues on the equator, irrespective of their tonal value. Itten’s sphere thus ignores Munsell’s recognition of the differences in value and absolute chroma of these colors, and lacks a consistent representation of the vital dimension of value. In contrast, modern color theory makes constant practical use of concepts of color space. Color spaces form a framework for all serious modern investigations of topics as diverse as color perception, color “harmony” and the emotive associations of color combinations. In future posts I will discuss how painters can use the Munsell dimensions of hue, value and chroma as a potent framework for observing colors, for understanding color mixing in paints, and for painting effects of light from the imagination. Texts explaining modern color theory for artists began to appear soon after the Helmholtz-Maxwell revolution, the most influential being Modern Chromatics, or The Students’ Text-book of Color (1879) by American physics professor and amateur painter Ogden Rood, which was published in three languages and numerous editions into the early 20th century, and again in 1973. A glance through its 330 pages is a revelation as to the level of technical understanding of color and light that was considered appropriate for art students in the era of Sargent and the late impressionists. Today, excellent introductions to basic modern color theory are available in The New Munsell Student Color Set and James Gurney’s (nicely complementary) Color and Light: A Guide for the Realist Painter, while more detailed information can be found on websites such as Bruce MacEvoy’s immense handprint.com, and my own more modest site, The Dimensions of Colour. Nevertheless, it is very clear that a great many art teachers are not planning to give up their attachment to simplistic traditional color theory any time soon. Indeed, art and design teachers educated in the age of Itten are now in positions of authority and influence, and have been known to actively suppress the introduction of modern color theory in their institutions. Student demand, fed by awareness of modern color theory now provided by the internet, presents the only prospect for speedy change. The current situation among art teachers is particularly disappointing when we recall that a century ago it was an artist and art teacher who was developing the system that would become the cornerstone of modern color theory.